Four of us wanted a quick bite to eat after catching an early movie and we chose Bertucci’s on Berlin-Cross Keys Rd. This recently developed area is home to several chain restaurants and Bertucci’s seemed as likely as the others to provide a decent meal. Without reservations, we were seated quickly in a booth and while we read the menu we were served some warm rolls with a very tasty olive oil based dipping sauce. Most of our entree choices came with soup or salad and all of us opted for the Sausage Soup . Nice and hot with veggies and rice and lots of pieces of spicey sausage this was a nice start to a rare meal without wine. The wine list at Bertucci’s is limited and I didn’t see anything of much interest so we all had Diet Cokes or iced teas with our meal. 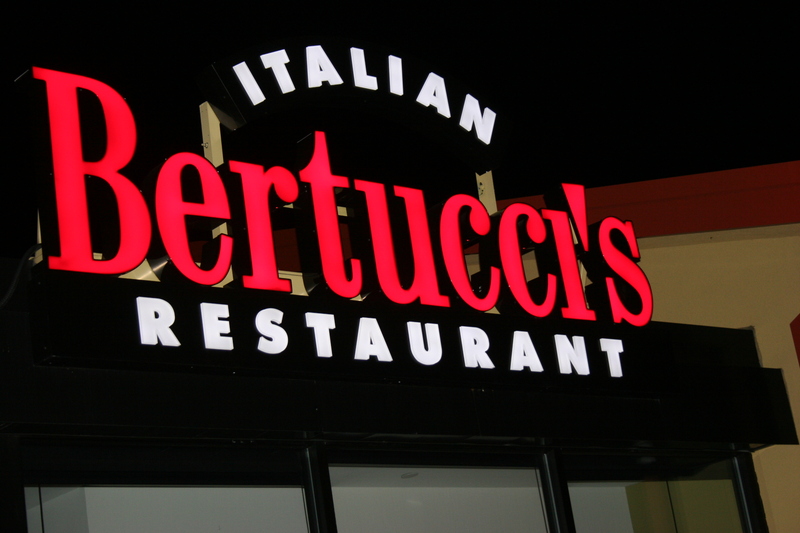 Bertucci’s features several items that are cooked in their brick ovens but none of headed in that direction. 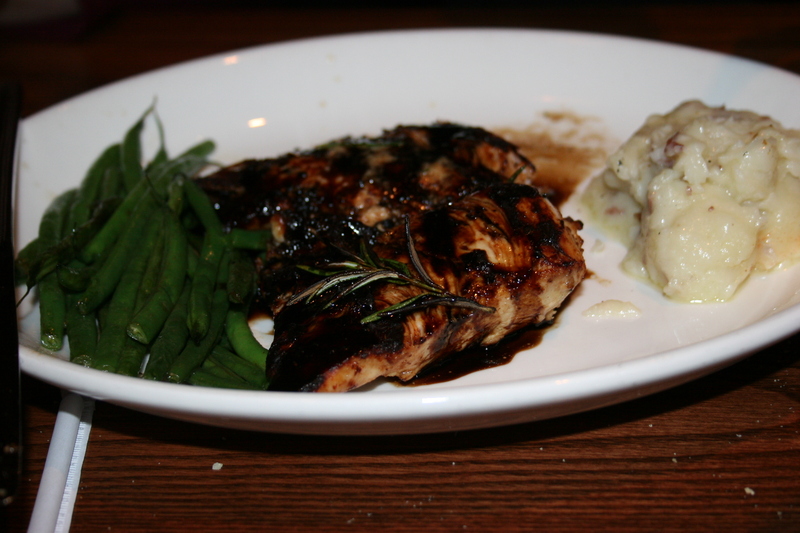 Joe B. had the Balsamic Chicken. Grilled chicken breasts drizzled with a balsamic glaze. Served with string beans and mashed potatoes. He was ok with it despite the fact that he thought the balsamic dressing overpowered the chicken just a bit. 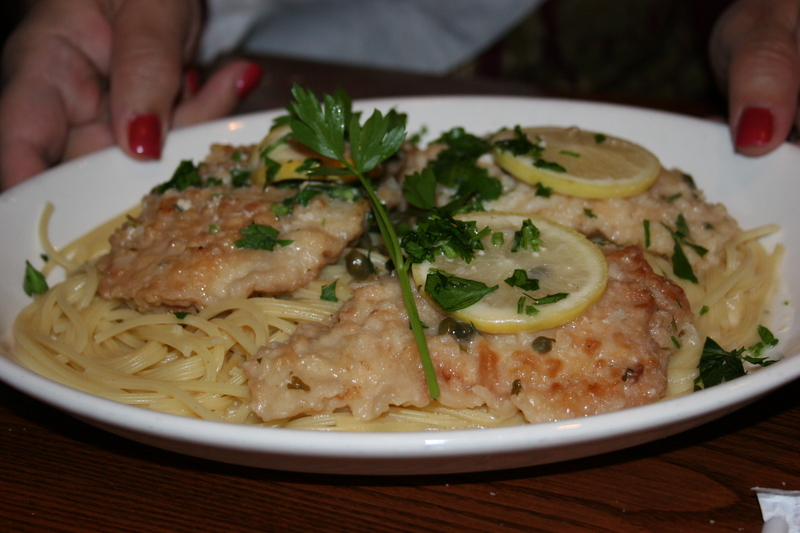 Fresh lemon, capers, white wine, Romano and fresh herbs atop tender breaded chicken filets over spaghetti. Served with a side Insalata or a cup of soup. 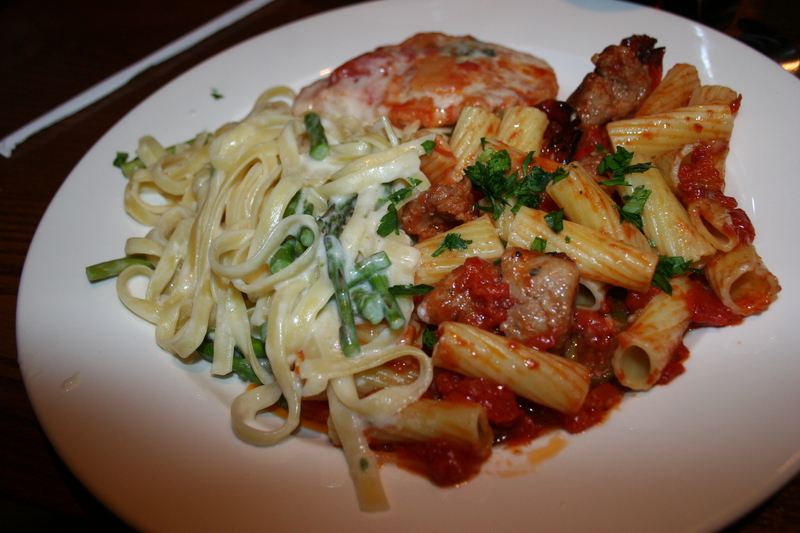 I thought this looked the best of all the dishes with three nice size pieces of chicken served over pasta. 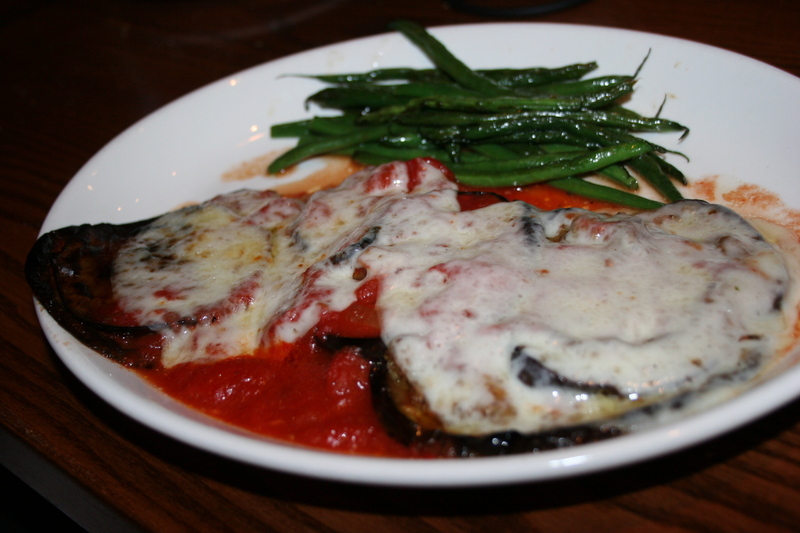 Eggplant layered with tomato sauce, provolone and grated Romano over spaghetti or with string beans. Served with a side Insalata or a cup of soup. Kathy liked that the eggplant was very thinly sliced and thought that highlighted the flavors. A trio of Bertucci’s favorites — Chicken Parma, Fettuccine Alfredo with Asparagus and Rigatoni Abruzzi. 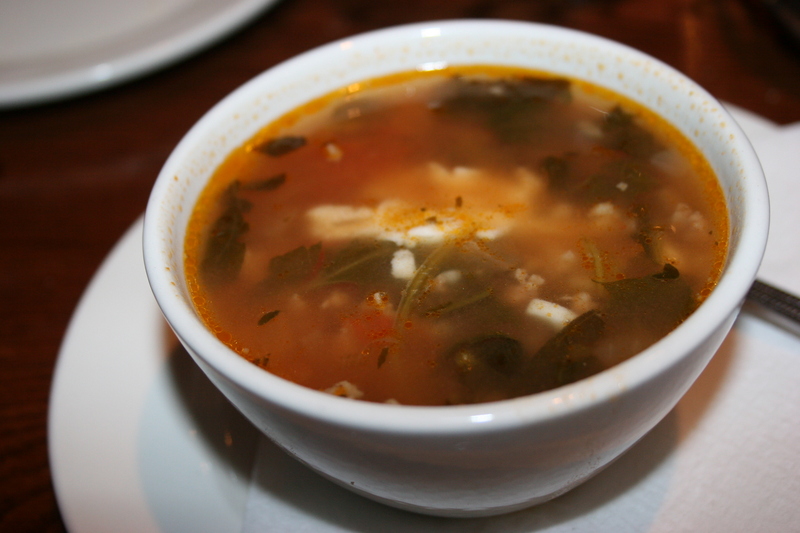 Served with a side Insalata or a cup of soup. This turned out to be a decent dish with none of the items really special. I’d have to say Bertucci’s is a place where you can enjoy good food at reasonable prices as long as you don’t arrive with really high expectations.